Search the MLS like an agent! A Brief History of stratford park. In 1991 Signature Properties a local builder broke ground on this new neighborhood, called Stratford Park At the time it was located at the far reaches in east Livermore, in fact many buyers felt it was 'too far away from town"
The homes were well built and well designed at least for the 1990s and sold well and for just over $300,000 you could find yourself living here, check the price list below. By the way that was a lot of money at the time! Nowadays the town of Livermore has grown eastwards and has now enveloped the neighborhood and with the opening of Mines road it is an easy drive to many stores restaurants and shopping. Stratford park's the Oxford plan has over 2000 sq feet 4 bedrooms and normally sits on a 10,000 sq foot lot. 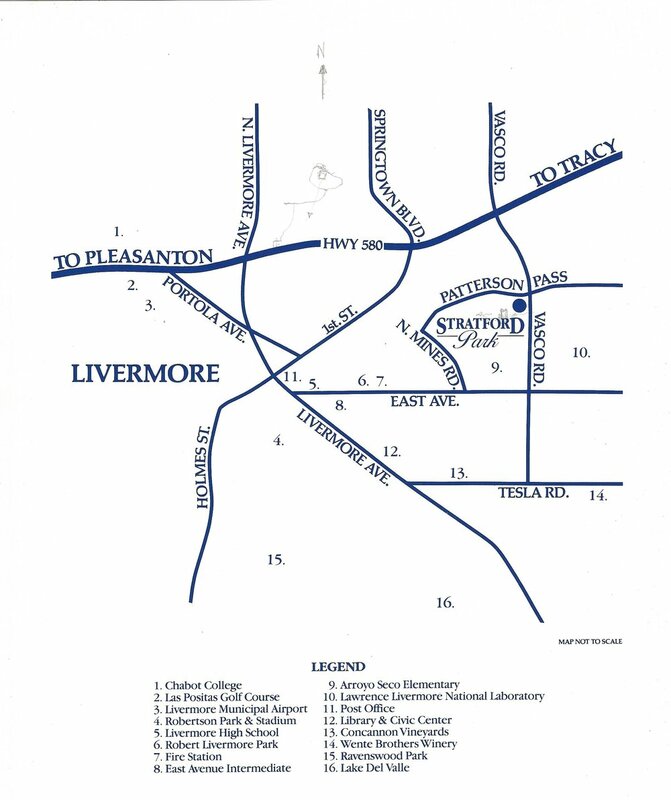 With 10,000 sq ft lots on average, an attached 3 car garage and close to nearby Livermore lab, these homes proved to be very popular with Lab employees as well as corporate transferees. Walk to the local Livermore ACE train stop! Did you know there are 5 different single level floorplans. Did you also know that almost all the square footages are incorrect as per the county tax assessor! Most of the builder square footage's differ from the public recordl. It is thought that when these homes were assessed the county assessor may have just performed a 'drive by' assessment to save time. It is important to disclose both square footage's to a potential buyer to avoid issues after sale. Stratford Park, Coventry and Avondale lay minutes away from the Arooyo Seco elementary school.area, which became a California distinguished school in 2012 and is one of the major reasons this neighborhood has become highly sought after. deeded to assist in maintaining uniformity of appearance and stbalizing property values. You can download a copy here. COVENTRY CCRS.